Making your patio child-friendly is important both for safety and for encouraging your kids to have outdoor activities. Especially now that kids are spending more time playing video games, a worry-free and inviting backyard will give them a healthy and active entertainment. The following are tips on how you can make your patio safe and fun for children. 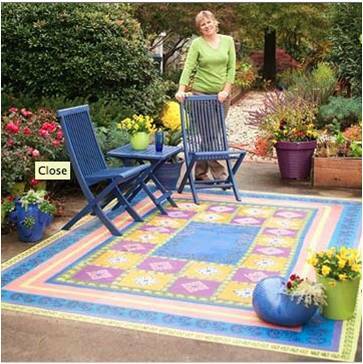 Keep them in mind as you decorate and prepare your patio for activities and parties. Fragile items such as ceramics and glassware are always prone to breaking when children are handling them. Active children do not always take caution so these items should be far from their reach. Aside from your kid breaking them, broken glassware pose a significant health hazard. So to reduce this risk, you can look for viable alternatives. This does not mean that you can only use paper plates and cups. You can purchase tough, durable plastic cups and dishes as alternatives. These are easy to maintain and do not break no matter how many times children drop them. If you prefer using china and glassware for adults and plastic items for kids, you should place the plastic ware in locations where children can easily reach them. Store the items be used by adults up on high tables where children cannot reach them. You should also place glass objects such as lanterns, candleholders and fragile decorative objects as high up as possible. A plastic folding chaise lounge or chair can seriously injure a child when it folds up. You should prevent such a situation from taking place at all costs by selecting suitable patio furniture. Ensure that the chairs and desks that you use on your patio are strong enough to support both adults and children. If they are made from wrought iron, make sure that they do not have any spikes, sharp edges or arrows since such features may injure a child. Very young children such as toddlers may trip and fall if the floor of your patio has rocky gravel paths, uneven flagstones or a cracked concrete floor. You should not take this for granted. Ensure that you maintain your patio properly, replace missing stones or patch holes and cracks immediately after you spot them. You should also ensure that the floor and walkway of your patio are level and clean to prevent injuries. Make sure that kids do not access items on the patio that may injure them. When children and adults mingle at a backyard as they participate in various activities such as barbequing, the presence of hot food can cause serious burns. 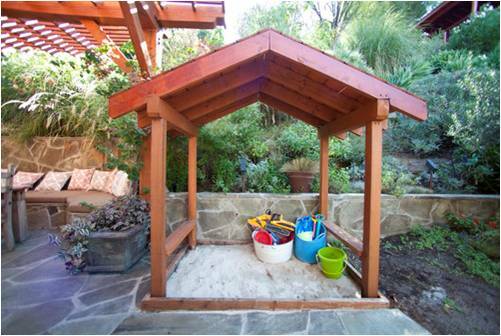 The best way to ensure that kids are always safe is to set up a special area for kids on the patio. You can use baby gadgets, benches and small screens to apportion a small part of your patio. You can also make benches more useful by creating some storage space underneath them and placing some cushions on top. This storage space is useful for storing items like balls, toys, kites and other toys. The other items that you can store under the benches include dishes, cups and silverware. It is essential for you to place some child size table and chairs in the kids section. This will ensure that kids have a safe place to dine away from the barbeque grill and hot food. Most children also love having their own area to play in. 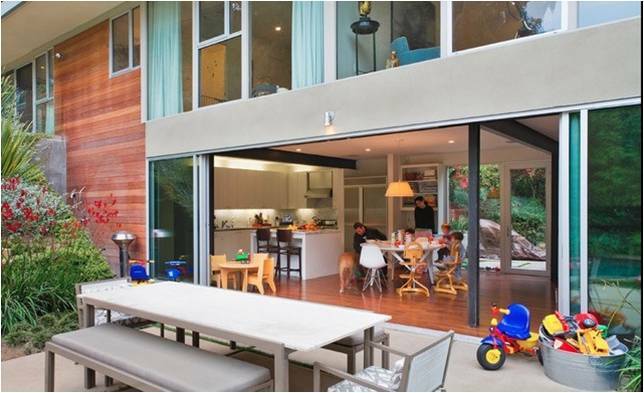 It is ideal to set up a children’s area on the patio’s outermost edge closest to the yard so that children do not obstruct the flow of traffic from inside and outside the house. Patio pavers are stones that offer a delicate solution for landscaping your backyard area. You can arrange them in the pattern that you like. The benefit of using pavers is that they are very durable and will make sure that your patio is completely safe for kids. Unlike concrete, pavers are not vulnerable to cracking. They are available in a wide range of sizes and shapes that you can combine to create attractive patterns. They also come in different textures such as weathered and smooth and in an extensive array of colors that can contrast or complement your home’s color scheme. Patio pavers can give your backyard a rustic appeal or sophisticated look depending on color and texture combination. As you install patio pavers, you should consider the patio designs available. Place your perfect patio chairs or sofa to where they accent the joints instead of covering them up. You should also consider the fact that you need to level up the landscape. This may involve excavating parts of your backyard. Adding a rug to your patio is great because it increases comfort and ensure that kids can use the area safely while barefoot. A rug placed underneath a dining table can set off that dining space from the rest of the patio. You can get a rug that is weather resistant. Many manufacturers are now making products that are designed to be used by children. A good example is special outdoor umbrellas for kids that come in a variety of colors and designs. 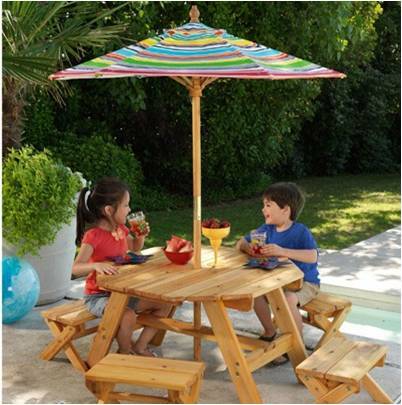 These umbrellas are great for keeping children in the shade as they play in the patio. They convert easily from table umbrellas for use in other spots in the backyard. Along with playful umbrellas, there are other items that you can add to your patio like sandboxes, ping-pong tables, tree swings, clubhouses, trampolines and tetherballs among others. These items will ensure that your kids enjoy playing in the patio immensely. Making your patio kid friendly is necessary and practical because you will always have peace of mind that your child is safe. It will also help you transform the appearance of your patio making it more attractive and exciting. Even if you maintain your patio’s color scheme, you can use different colors or new pattern designs on pillow covers and cushions. Transforming your patio in this way will make it inviting to your friends, family and kids who will enjoy spending time in it.